It wouldn't be London Open House if 2012's Olympic legacy wasn't still dribbling on. Here East is a silly name, but not as silly as iCity, which was the original brand name for the giant sheds at the top of the Olympic Park. In 2012 they were used to house the world's media - one for the press and one for TV, plus another for a multi-storey car park. The car park is still there but the media are long gone, which left the thorny issue of what to do with a vast amount of interior space which had been used for only eight weeks. There were pipedreams at one point for the construction of a snowdrome and artificial ski slope, then plans for the filming of EastEnders to move here from Borehamwood, given that the postcode genuinely is E20. But all of that fell through, and a decision was ultimately taken to turn Here East into a place for design, innovation and making things. It's all very Hackney Wick, I think was the inspiration. The Press Centre has a quarter of a million square feet of floor space, which is a lot to let, spread over four waterside floors. Most of the building is still empty, awaiting negotiation with clients, with the prime space probably on the first floor beside the roof terrace, from which the City, Docklands and several local flats can be seen. One huge chunk is pencilled in as an open plan innovation incubator, where start-ups can gain a toehold and grow before moving off somewhere bigger. A hotel, or members' club, has an eye on part of the southern end, and a row of foodie-nibbly stuff has invaded the retail spaces on the canalside. If you've ever wanted to dine at a branch of Breakfast Club where the queues aren't out the door, and don't mind the trek, Here East is for you. The Broadcast Centre has two thirds of a million square feet of floor space, plus a dozen tricky-to-sell central voids which in summer 2012 housed huge TV studios. But 'windowless' is just what some clients want, so six have become a data centre, one will be a university robotics lab, and two have been taken by BT Sport. All that football continuity you watch before, after and sandwiched inbetween the big match, all that comes from here, and may soon be scripted in an amazing globular meeting space suspended above reception. 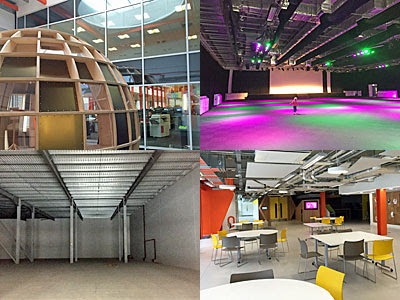 Meanwhile Loughborough University have taken the building's northern slice, all the better for attracting foreign students, while an open-fronted grid facing the main park called The Gantry is being filled in with artists' workshops, a bit like a Boxpark for the arts. Perhaps most intriguingly, linking the two main buildings is a smaller-but-still-large building on stilts. It has to be on stilts because all of the main pipes and cables servicing the Olympic Park pass in a conduit underneath - that string of electricity pylons they removed in 2008 had to go somewhere. This building is The Theatre, or that's its intended future use, providing conference and events space on a scale not generally available hereabouts. But for London 2012 it was designed as a refuge for the world's journalists, somewhere safe to hide should an act of terrorism break out, which of course it didn't. But it pays to be prepared, even if this huge room was used only once during the Games, for a press conference where Seb Coe attempted to explain why there were empty seats. Please hire it soon, someone, and bring it life. A more unusual form of Olympic legacy sits downstream, near Bromley-by-Bow, astride the River Lea. More accurately it sites astride the Prescott Channel, a thread of the Bow Back Rivers, a distinction which has proved to be important. 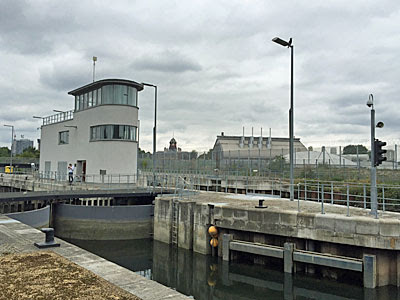 Three Mills Lock is the only lock to be built on a waterway in London this century, and it's a biggie. 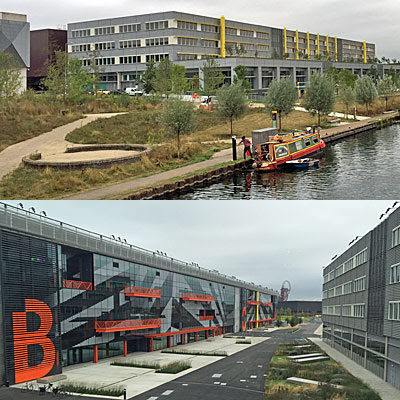 It was planned with good intentions, and £23m of cash, the idea being to provide access for large barges delivering construction materials to the Olympic Park and thereby reduce the number of journeys made by road. Unfortunately the lock was completed ten months behind schedule, by which point contractors had already defaulted to lorries, and so very little freight or waste actually passed this way. Still, British Waterways were pleased. 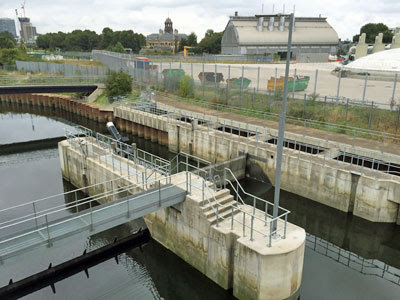 They'd always wanted to upgrade the derelict Bow Back Rivers but could never afford it, and now they had a long-term restoration project plus a giant state-of-the-art lock. Property developers were delighted too, because the new lock permanently stops the channel upstream from being tidal, and it's so much easier to sell property beside a river that doesn't ebb twice a day revealing mud and discarded tyres. For Open House the lock was opened up to visitors, and a steady stream trotted across Three Mills Green to take a look. It was also possible to look inside the central control tower, a three storey structure linked by a spiral staircase, and with an observation deck on top. This provided good views of the adjacent area, including the Bow flyover, the gothic Abbey Mills Pumping Station and its modern replacement, and the gasholders at Twelvetrees. I was particularly interested to be able to see the cap of the Lee Tunnel, Newham's new supersewer and the deepest bore in London. Alongside is the site of the first Big Brother house, now covered by a landscaped pile of spoil, and destined (one day) to be reopened as a public space. But don't get your hopes up - the footpath alongside has been sealed off for the best part of nine years, and the sign saying it reopens in "early 2016" looks increasingly fictional. Three Mills Lock has quite a complicated structure, ably explained to us by the two employees of the Canal and River Trust who pop over to operate the machinery should the automated systems be insufficient. On the far side is a fish pass, a series of chambers on a gradient allowing upriver migration to take place, although apparently there's no evidence it's being used by anything more substantial than a few eels. Next come the weir gates, one of which automatically rises or falls every ten minutes to help balance the water level on either side. And then there's the main lock, by far the longest and widest in the area, with 20 ton 'fish belly' gates at either end which can be opened in ten minutes if they're ever needed.